Chamber Music at the Clark concert seating is determined via lottery. The booking-by-lottery entry form for American String Quartet seats posts here on Thursday, January 26, 2017. Lottery registration closes Thursday, February 16, 2017. Internationally recognized as one of the world’s foremost quartets, the American String Quartet celebrated its 40th season in 2015–16. Critics and col­leagues hold the quartet in high esteem, and many of today’s leading artists and composers seek out the ensemble for col­lab­o­ra­tions. 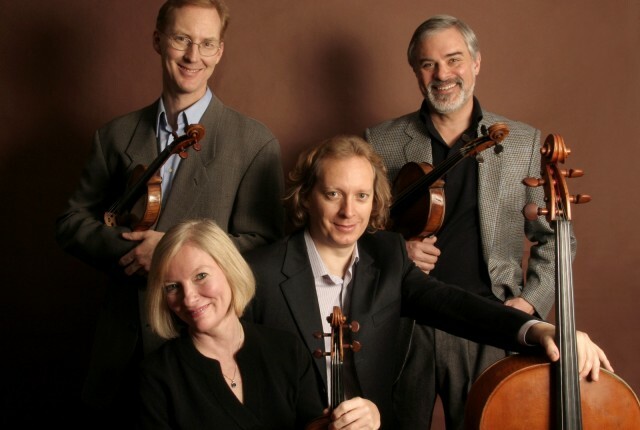 The American String Quartet is also known for its performances of the complete quartets of Beethoven, Brahms, Schubert, Schoenberg, Bartók, Mendels­sohn, and Mozart, as well as all the string quintets of Mozart, Mendels­sohn, and Brahms. The group’s recordings of the complete Mozart string quartets on a matched set of Stradi­varius instruments are widely held to set the standard for this repertoire.